In addition to the main Sakya tradition, there are three sub-divisions of the Sakya tradition—the Ngorpa, the Tsarpa and the Dzongpa. The Ngorpa sub-sect was founded by Ngorchen Kunga Zangpo (1382-1457) with the establishment of the Ngor Evam Monastery in 1430. The current head of Ngorpa sub-sect is His Eminence Luding Khenchen Rinpoche. The Tsarpa sub-sect was founded by Tsarchen Losal Gyatso (1502-1556) with the establishment of the Dar Drongmoche Monastery. The head of Tsarpa sub-sect was His Eminence Chogye Trichen Rinpoche, who passed away in 22 January, 2007. Lamdre contains teachings and practices covering the whole range of sutra and tantra teachings given by the Lord Buddha. But its main teachings are based on the Hevajra Tantra. Lamdre was brought to Tibet by the Tibetan translator, Drogmi Lotsawa, in the middle of 10th century, and was later codified in 12th century by Sachen Kunga Nyingpo. This teaching has since been passed down through an unbroken lineage of masters to the present day. During the time of Muchen Sempa Chenpo Konchok Gyaltsen, Lamdre was divided into two sub-traditions: The Explanation for Private Disciples or the uncommon Lamdre (Lobshey) and the Explanation for the Assembly or the common Lamdre (Tsokshey). The crux to this golden teaching is the inseparability of the worldly existence (Samsara) and enlightenment (Nirvana). It follows that Nirvana is merely a transformation of Samsara. There is no abandoning of Samsara in order to achieve Nirvana, as the mind is the root of Samsara and Nirvana. Realising this inseparability is the key to attaining enlightenment. He was born in 1945 in Tibet and travelled with his family to India in 1959 where he continues to live and rebuild both the lay and monastic elements of the Sakya tradition. He has guided the establishment of over thirty monasteries in India and Nepal and has helped found Sakya centres around the world. 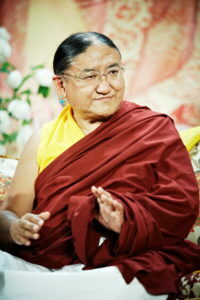 His Holiness Sakya Trichen is the Spiritual Head of the Sakya Tsechen Thubten Ling Centre in Vancouver, Canada. His Eminence Gyana Vajra Rinpoche the younger son of His Holiness Sakya Trichen, was born in 1979. He studied alongside his brother and later joined Sakya Centre in Rajpur, to further his religious training. Following the completion of his studies and training at Sakya Centre he joined Sakya College to study Buddhist philosophy. At present he has set up the Sakya Academy which provides young novices a good Buddhist and general education. He also travels abroad to teach the Dharma to non-Tibetan students. 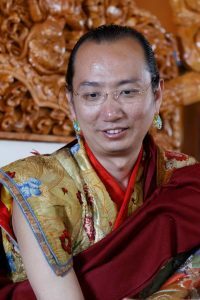 His Eminence Kyabje Dorje Chang Luding Khenchen Rinpoche is one of the most highly respected and learned teachers of the Sakya tradtion and of Tibetan Buddhism at large. He is believed to be the emanation of Vajrapani. His Eminence is the Head of the Ngor, one of the three sub-sects of the Sakya tradition. He was born to the clan of Shang, Sharchen or Ludingpa, which is renowned for producing great scholars and siddhas. 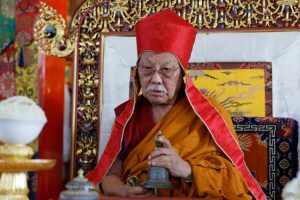 His Eminence Luding Khen Rinpoche was enthroned on 16 March 2000 as the abbot of the Ngor Monastery of the Sakya order, and head of hundreds of other branch monasteries. He is one of the most important young lineage holders of the Sakya order. He is the resident Lama of our centre, he is from the the Sakya Ngorpa monastery in India. At ten year old he entered the Monastery to become a novice monk. After 17 years of study and intensive training in all aspects of Buddhism including all types of ritual, torma making, the playing of musical instruments, shrine management as well as completing several retreats, he earned the title of Mahakala Master and was recognized as a Lama. 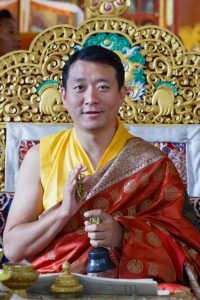 In 2005 he was invited to stay in Australia and work for the Sakya centre, Sakya Tharpa Ling, as the resident Lama and assistant to Venerable Khenpo Ngawang Dhamchoe. Lama has also travelled worldwide with Jetsun Kushok Rinpoche to assist her in her international teaching programmes. These tours have included Australia, Europe, Malaysia and Singapore. In 2009 Jetsun Kushok Rinpoche invited him to move to Vancouver and assist her with the Vancouver Sakya centre’s activities. 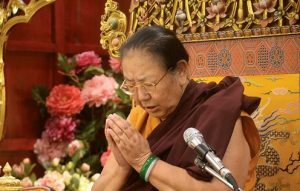 Lama Ngawang is fluent in many languages including English and provides regular classes to practitioners who wish to learn about Buddhist rituals in the Sakya tradition. His compassion and kindness make him accessible and approachable to all. People also seek his counsel and support in their personal lives.